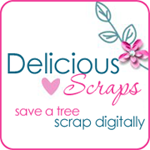 Delicious Scraps: New Commercial Use 2Image Pattern Maker Action and Free CU Sampler! New Commercial Use 2Image Pattern Maker Action and Free CU Sampler! I have a brand new PS Action in my shop that will create a two image pattern with a flip or a rotation :) A very useful tool! Tested in CS 2, 3, 4, and 5. A must have and on sale for 99 cents!! Thank you! what a great pattern. Thank you so much for this post. I want to let you know that I posted a link to your blog in CBH Digital Scrapbooking Freebies, under the Page 3 post on Sep. 24, 2010. Thanks again.